Our terroir is formed through a combination of our unique location, the cool Atlantic and long coastlines, vertigoes mountains and some of the oldest soils in the world. 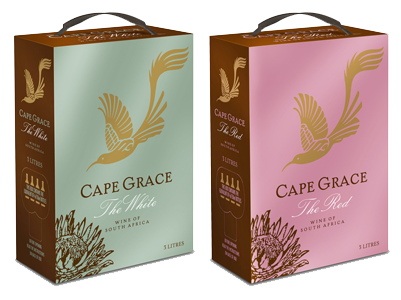 Cape Grace wines were created to convey all these exceptional attributes in wines that are uniquely South African and which offer affordable indulgence. 'The White' is a blend of Chenin blanc, Semillon and Colombard. This delicious wine is packed with summer fruit flavours with a touch of citrus zest. A great 'all-rounder' to enjoy on its own or with fish, poultry and pasta dishes. 'The Red' is a blend of Ruby Cabernet, Pinotage and Cinsault. Juicy red and black berry fruit flavours with a spicy backbone makes this wine perfect for a summer barbeque or a stew for those long winter evenings. This well balanced Chenin Blanc shows a complex nose of tropical notes of pineapple and guava with nuances of pear and heather. The palate is full and rich with pronounced apricot and peach flavours. The finish is crisp and refreshing. Sunshine in a wine, enjoy! Made of 100% Pinotage the wine has a deep purple-red colour. The wine has lovely nose of bright red berries and cherries with a hint of fresh garden herbs. The palate bursts with freshly crushed berries and ripe plum flavours with a touch of oriental spice. Well balanced with firm tannins and a perfumed finish. A beautifully balanced and elegant expression of Shiraz. The colour is a deep velvet red and the nose is slightly smoky with spicy notes of cloves and cinnamon and a hint of mocha . The palate bursts with plums and black currant fruit flavours with smooth and silky tannins. Finely structured and well balanced with a rewarding long finish.